I used to go "asparagus hunting with my Mom when I was growing up. And to make a long story short I now have taught my 4 kids (the youngest is 3) where to find the wild asparagus and what it looks like, we have great adventures doing it. We say " It's so lovely to hear stories like this from people we've never met. 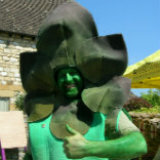 Thank you for sending us your picture and short story Jamie"
Click here to return to Wild Asparagus Locations. Wild Asparagus look a like any suggestions? 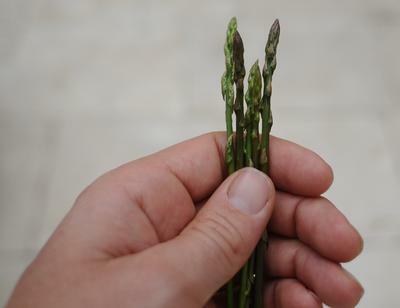 I was picking wild Asparagus yesterday (March 31st) in Montenegro (Balkan region, E. Europe). I have been looking for information on a similar look-alike found the the same habitat as the wild asparagus, often growing directly next to it. See two photos uploaded. 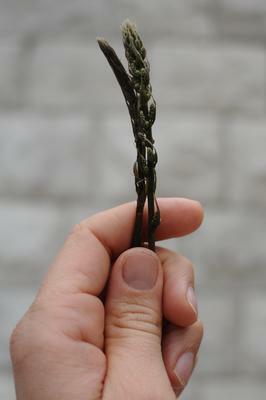 The first is of wild asparagus, the second is of the look-alike. Any ID suggestions? Mid-April you will find this wonderful vegetable in grassy areas between the highway and a farmers field along the fence. Since I have learned about wild asparagus, I have been on the search for the plants. It is now the tail end of summer and I have a pretty long list of where I've seen the plants that are seeding. They are all over! I only hope that when spring comes, I won't be too late! We have a friend who harvested wild asparagus for years. He would mark his various patches with a small bit of litter, smashed and buried beneath weeds so only he would think to look for it. Our friend began to have bad knees and could no longer keep his patches up to encourage their spring production, so he handed down the location of an easily seen patch near our home. It was great entertainment to enjoy the brief walk there, and be careful not to be seen by any other interested parties. Since, we've planted our own patch. Its lovely to hear people's stories about their wild asparagus finds. Thank you everyone. I was walking with my preschool class when we decided to play in the ditch by the train tracks and found some wild roses so I explained to them that they were edible then I looked over and saw the ferns of the asparagus with the small green berries got excited now I can show them come next spring!!! I have several spots here in my home town of Windsor. The spears are all so different. Some are green and straight and 14 inches long and some are purple and twisted like a corkscrew. There is no comparison to wild asparagus. Great with an Ontario Top serloin and a cold lager. 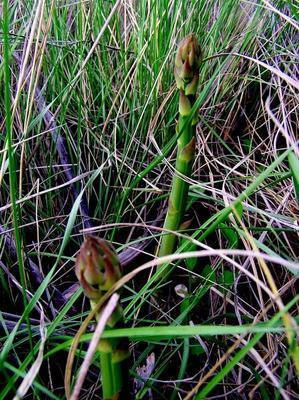 PLEASE could you share with your fellow Windsorite where to find this wild asparagus?!! I remember seeing people on the side of the road when I was a kid, but have no idea where to look now! The hills around our village are full of wild asparagus in the winter and spring months, young boys go up in the early morning and come back laden with it a couple of hours later to sell on the streets.